This article is about the basketball player. For the NASCAR driver, see Kevin Love (racing driver). The son of former NBA player Stan Love, Love was a top-ranked prospect out of Lake Oswego High School in Oregon. He played one season of college basketball for the UCLA Bruins and led the team to a Final Four appearance in the 2008 NCAA Tournament. Love was named a consensus First Team All-American and was voted player of the year in the Pac-12 Conference. He elected to forego his remaining three years of college eligibility and entered the 2008 NBA draft. He was taken fifth overall by the Memphis Grizzlies, and was traded to the Minnesota Timberwolves on draft night for the third overall selection, O. J. Mayo, in an eight-player deal. During the 2010–11 season, Love established the longest streak for consecutive games recording double figures in points and rebounds since the ABA–NBA merger. He was traded to the Cavaliers in 2014. 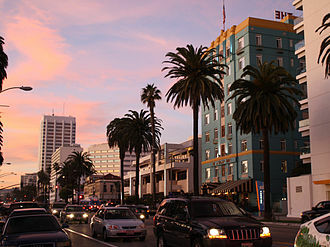 Love was born on September 7, 1988, in Santa Monica, California, the second of three children to Karen and Stan Love. He grew up in Lake Oswego, Oregon, where he was childhood friends and Little League teammates with fellow future NBA star Klay Thompson. Love played basketball from his earliest days; as a child, he would practice his bounce passes with a cardboard box and study tapes of Wes Unseld. Love played high school basketball for the Lake Oswego Lakers. In his sophomore season, he averaged 25.3 points, 15.4 rebounds, and 3.7 assists per game, leading the Lakers to the 2005 state championship game, where they lost to Jesuit High School. The following summer, Nike removed him from its Portland Elite Legends AAU team after he chose to participate in the Reebok ABCD Camp against other top recruits. He went on to play for the Southern California All-Stars, helping the team compile a 46–0 record while garnering three MVP awards. In his junior year, he averaged 28 points, 16.1 rebounds, and 3.5 assists per game as Lake Oswego returned to the state championship game, this time winning behind Love's 24 points and 9 rebounds. In his senior season, he averaged 33.9 points, 17.0 rebounds, and 4 assists per game. Lake Oswego made their third straight trip to the state championship game, losing in a rematch of the prior year's final to South Medford High School and Love's rival Kyle Singler despite 37 points from Love. At the conclusion of the season, Love was named the Gatorade National Male Athlete of the Year. He was also a first-team Parade All-American. He finished his high school career as the all-time leading scorer in Oregon boys' basketball history with 2,628 points. "2007 UCLA Basketball Commitment List". Rivals.com. Archived from the original on February 27, 2017. Retrieved February 27, 2017. "2007 UCLA College Basketball Team Recruiting Prospects". Scout.com. Archived from the original on February 27, 2017. Retrieved February 27, 2017. "UCLA Bruins 2007 Player Commits". ESPN.com. Archived from the original on February 27, 2017. Retrieved February 27, 2017. "2007 Team Ranking". Rivals.com. Retrieved February 27, 2017. In July 2006, Love verbally committed to play college basketball at UCLA. He had also considered playing for North Carolina. Prior to the 2007–08 season, he received permission from Walt Hazzard to wear number 42 for the Bruins even though the school had retired the number for Hazzard in 1996. After arriving at UCLA, Love regularly sought out retired Bruins legends Bill Walton and John Wooden for advice. His decision to play for UCLA brought animosity from fans of Oregon, his father's alma mater, where it was expected Love would play. Prior to a game at Oregon, Ducks fans obtained Love's cell phone number and left obscene messages as well as death threats; the fans also subjected Love's family to obscenities and threw garbage at them during the game. This event, along with similar incidents directed at other players, prompted a discussion of whether abuse by college basketball fans is becoming too extreme. 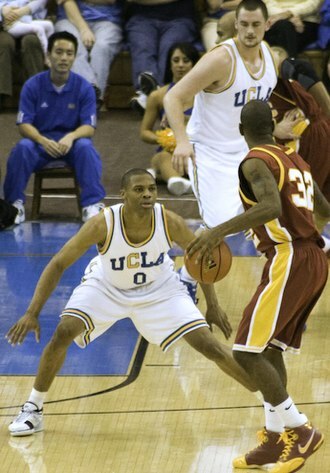 In the 2008 Pacific-10 Conference Men's Basketball Tournament, the Bruins defeated the USC Trojans, featuring O. J. Mayo, in the semi-finals. Both Mayo and Love were nominated to the All-Pac-10 tournament team. Later, Love guided UCLA to the regular season Pac-10 conference championship, the conference tournament championship, and a No. 1 seed in the 2008 NCAA Men's Division I Basketball Tournament. 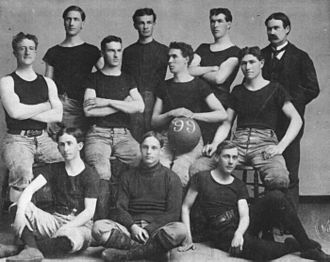 Love helped the Bruins to the Final Four of the tournament, where they lost to the Memphis Tigers, whose season and tournament appearance in turn were later vacated. At the end of the 2007–08 regular season, Love was named consensus first-team All-American, Pac-10 Player of the Year, All-Pac-10, and Pac-10 Freshman of the Year. He led the Bruins with 17.5 ppg, 10.6 rpg, and 23 double-doubles. Love went on to play in the 2008 NBA Summer League and led all players in rebounding. In his NBA debut on October 29, Love came off the bench to contribute 12 points and nine rebounds in a 98–96 win over the Sacramento Kings. The Timberwolves lost 15 of their first 19 games, prompting the dismissal of head coach Randy Wittman. Timberwolves general manager Kevin McHale assumed duties as head coach and they developed a close relationship. 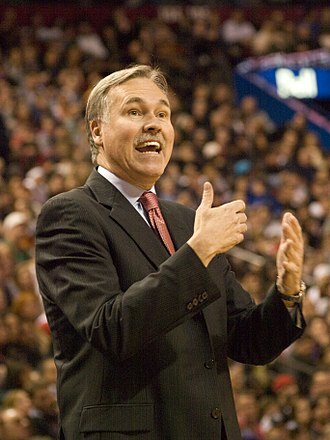 Under McHale, the Timberwolves improved their play in January by going 10–4, with Love averaging a double-double. Love was not selected to the NBA All-Star Weekend Rookie Challenge, to the surprise of his teammates and coaches. After the team's leading scorer Al Jefferson was sidelined for the rest of the season with a torn ACL in February, Love's minutes increased, and he was named NBA Rookie of the Month for March. Love finished the season ninth in the league in rebounding, first among rookies, and ranked third in total offensive rebounds. Love also led all first-years with 29 double-doubles, the most by a Timberwolves rookie in franchise history. He also ranked first in the league in offensive rebound percentage, becoming the first rookie to lead the league since Hakeem Olajuwon in 1984–85. He was named to the 2009 NBA All-Rookie Second Team and finished sixth in Rookie of the Year voting. In the off-season, Love was invited to participate in the USA National Team mini-camp that was conducted from July 22 to 25 in Las Vegas. 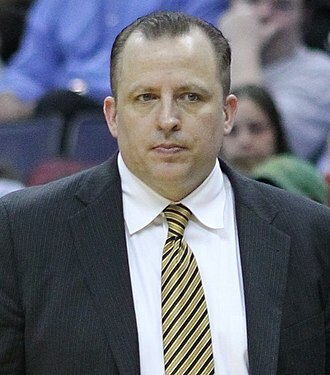 Love also generated attention from his Twitter account when he broke the story that Kevin McHale would not return to coach the Timberwolves for the 2009–2010 season. Love began the season on the injured list when, in a pre-season game on October 16, 2009 against the Chicago Bulls, he broke the fourth metacarpal in his left hand by banging it against the elbow of teammate Oleksiy Pecherov. Following surgery, Love missed the first 18 games of the season. He returned against the New Orleans Hornets on December 4, 2009, and made immediate impact for the Timberwolves, who were struggling out of the gate with a 2–16 record. Love was selected to play in NBA All-Star Weekend Rookie Challenge. He finished the season ranked as the NBA's best rebounder per 48 minutes (18.4), besting Dwight Howard (18.3) and Marcus Camby (18.1). The Timberwolves' trade of Jefferson before the 2010–11 NBA season was expected to result in more playing time for Love. However, he averaged 28 minutes through the first nine games, exceeding 30 minutes only twice. Chris Mannix of SI.com wrote that many speculated there was a rift between coach Kurt Rambis and Love. In a home game against the New York Knicks on November 12, 2010, Love became the 19th player to record a "30–30" game, when he recorded 31 points along with a career-high 31 rebounds. His 31 rebounds set a Timberwolves franchise record and were also the most by a player in an NBA game since Charles Barkley recorded 33 rebounds in a game in 1996. 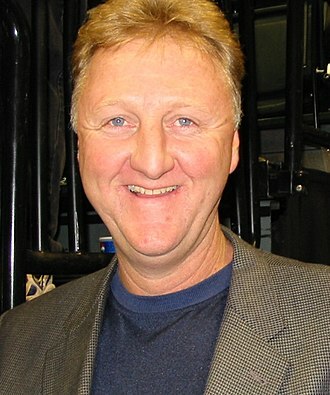 Love became the first player to record a 30–30 game since Moses Malone in 1982. Love scored a career-high 43 points and had 17 rebounds on December 18 in a 115–113 loss to the Denver Nuggets. On February 4, 2011, Love was selected by Commissioner David Stern to his first NBA All-Star Game as replacement for the injured Yao Ming. The day before, Love was not selected as an All-Star as a reserve although averaging 21.4 points, a league-best 15.5 rebounds, shooting 43.9 percent from 3-point range, and having 34 straight double-doubles for the 11–37 Timberwolves. On February 8, Love set a team record (previously held by Kevin Garnett) with his 38th consecutive double-double after scoring 20 points and recording 14 rebounds in the Timberwolves' 112–108 win over the Houston Rockets. He scored 37 points and had 23 rebounds on February 27 in a 126–123 win over the Golden State Warriors. It was his fourth 30-point, 20-rebound game of the season, and Love went 18 for 23 from the free throw line to tie Minnesota's team records for made and attempted free throws. On March 13, Love's consecutive double-double streak ended at 53 games in a loss to the Golden State Warriors. It was the longest streak since the ABA–NBA merger in 1976, surpassing Malone's 51-game streak from 1979 to 1980. Love was two short of Elvin Hayes's streak of 55 consecutive double-doubles set in the 1973–74 season. 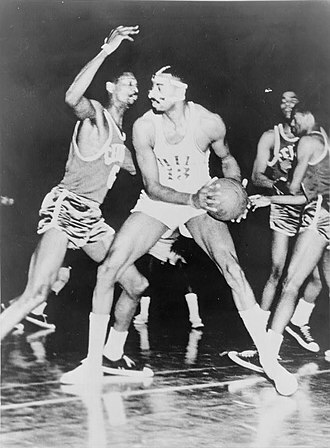 According to the Elias Sports Bureau, Wilt Chamberlain holds the record with 227 consecutive double-doubles from 1964 to 1967. The NBA does not recognize the double-double as an official statistic. Love suffered a strained left groin on March 20 against Sacramento. He missed the final six games and nine of the last 11 games of the season due to the injury. Love led the NBA in rebounding averaging 15.2 per game. He won the NBA Most Improved Player Award after increasing his points per game by 44 percent and his rebounds per game by 38 percent over his previous season. Love established career highs in rebounding, scoring (20.2), assists (2.5), double-doubles (64), field goal percentage (.470), free throw shooting (.850), 3-point shooting (.417) and minutes played (35.8). 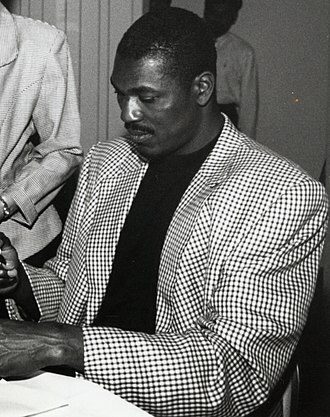 He became the first player to average at least 20 points and 15 rebounds in a season since Malone in the 1982–83 season. He emerged as the new face of the franchise since Garnett was traded from the Timberwolves to the Boston Celtics in 2007. In 2010–11, Love's No. 42 was the Wolves' top-selling jersey; sales were comparable to Kevin Garnett's when he was in his prime. This was Love's contract season. He had stated that he wanted to be the Timberwolves' "designated player" for a five-year deal  during the offseason (a designated player offer must be made prior to the final year qualifying offer), but he was denied this contract by the Timberwolves. Contract negotiations became tense, leading to an incident where David Kahn (team GM) "marched" into the players training room and "thrust [...] a contract offer sheet into his hands". Love responded, "I'm not the one to always follow professional protocol – but I do know what it is, even at 24 years old". They eventually settled on four years with a player option for Love to opt out after the third year. The four-year contract extension worth up to $62 million was finally agreed to, and signed, on January 25, allowing Love to become an unrestricted free agent as early as 2015. Love has stated that he felt very strongly that he should have had a five-year designated player extension, and would have accepted the offer, had it been offered to him. Love followed up this new contract extension the subsequent night with a 31-point performance in a win over the Dallas Mavericks. In January 2012, Love scored 30 points in three consecutive games for the first time in his career. He began the season recording 15 straight double-doubles, the first player to do so since Hakeem Olajuwon in the beginning of the 1992–93 NBA season. On January 20, Love made a three-point buzzer beater to defeat the Los Angeles Clippers. On February 6, Love was given a two-game suspension for stepping on the face of Houston's Luis Scola. After the February 4 game, Love had said, "I mean, he fell down after the play. He just kind of laid there and... I just happened to be there. I had nowhere to go. I got kind of tripped up and I just had nowhere to step. He was right there... and it happened to be his face." On February 25, Love participated in the Three-Point Shootout and defeated Kevin Durant in the final tie-breaking round to win the contest. Love scored a season high 42 points in a win over the Portland Trail Blazers on March 3. Love set a franchise record for most games scoring over 30 points in a season on March 12 in a victory over the Phoenix Suns. He also had a career-high 51 points in a 149–140 double overtime loss to the Oklahoma City Thunder. The following game, Love erupted for 30 points and grabbed 21 rebounds in a win over the Denver Nuggets. For the season, Love was named to the All-NBA second team and finished sixth in MVP voting. In the offseason, Love voiced frustration with Minnesota for not being a playoff team. 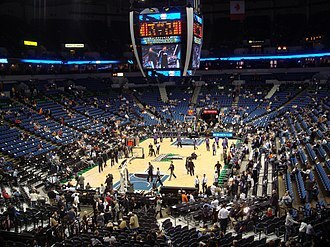 The Timberwolves finished with the Western Conference's fourth-worst record at 26–40, which was still the franchise's most wins since the 2006–07 season. On October 17, 2012, it was reported that Love would miss six to eight weeks after breaking the third and fourth metacarpals on his right (shooting) hand during a morning workout. Love surprised fans by returning to the Wolves on November 21, just five weeks after sustaining the injury. He played 35 minutes and scored 34 points while grabbing 14 rebounds against the Denver Nuggets. In December, Love would score 36 points against the Cleveland Cavaliers, yet he continued to voice his frustration with the team's front office. On February 22, 2014, Love recorded his first career triple double with 37 points, 12 rebounds, and a career-high 10 assists in a 121-104 win over the Utah Jazz. On March 9, Love, with a 3-pointer midway through the third quarter of Minnesota's 104-111 loss to the Raptors, broke the Timberwolves’ franchise record for 3-pointers in a season. With that make (143), he passed Rashad McCants' record of 142 in the 2007–08 season. On March 28, he recorded his second career triple double with 22 points, 10 rebounds and 10 assists in a 143-107 win over the Los Angeles Lakers. On April 2, 2014, Love recorded his third career triple double with 24 points, 16 rebounds and 10 assists in a 102-88 win over the Memphis Grizzlies. Love set an NBA record in 2013–14, becoming the first player in NBA history to record 2,000 points, 900 rebounds and 100 3-pointers in a single season. He was named to the All-NBA Second Team for the second time in his career. On February 8, 2015, Love scored a season-high 32 points on 11-of-18 shooting in a 120–105 win over the Los Angeles Lakers. On February 24, he scored 24 points on eight three-pointers, tying his career best, as he helped the Cavaliers defeat the Detroit Pistons, 102–93. Love helped the Cavaliers win 34 of their final 43 games to finish the regular season as the No. 2 seed in the Eastern Conference with a 53–29 overall record. In his first career playoff game on April 19, Love recorded 19 points and 12 rebounds in a 113–100 win over the Boston Celtics in Game 1 of their first-round playoff match-up. Cleveland swept the series 4–0, but Love missed the remainder of the playoffs after he dislocated his left shoulder in the first quarter of Game 4 when he got tangled with the Celtics' Kelly Olynyk while battling for a loose ball. Love called it a "bush-league play", while Olynyk said he would "never intentionally hurt someone." The league ruled that Olynyk had "yanked Love's arm down", and suspended Olynyk for one game. Love underwent surgery to repair his shoulder and the team said he would need four to six months to recover. Without Love, the Cavaliers reached the 2015 NBA Finals but were defeated by the Golden State Warriors in six games. On June 24, 2015, Love opted out of the final year of his contract, worth $16.7 million in 2015–16, to return to free agency. On July 9, 2015, Love re-signed with the Cavaliers. On November 23, 2015, he scored 27 of his season-high 34 points in the first half of the Cavaliers' 117–103 win over the Orlando Magic. On January 29, 2016, he had his best game since November 23, scoring 29 points on 9-of-19 shooting in a 114–106 win over the Detroit Pistons. That game also marked the first time all season that Love, LeBron James and Kyrie Irving each reached 20 points in a game. The Cavaliers finished the regular season as the first seed in the Eastern Conference with a 57–25 record. In the first round of the playoffs, the Cavaliers faced the eighth-seeded Detroit Pistons, and in a Game 1 win on April 17, Love recorded playoff career highs with 28 points and 13 rebounds. Love helped the Cavaliers advance through to the Eastern Conference Finals where they faced the Toronto Raptors. He struggled in Games 3 and 4 of the series, scoring just 15 total points, before bouncing back in Games 5 and 6 to help the Cavaliers defeat the Raptors 4–2. The win advanced them through to the NBA Finals, where they faced the defending champion Golden State Warriors. Love's struggles in the NBA Finals were well documented. After recording 17 points and 13 rebounds in a Game 1 loss, a concussion suffered in Game 2 forced him to miss Game 3. His return in Game 4 saw him come off the bench to score 11 points, but with a 108–97 loss, the Cavaliers fell behind 3–1 in the series. Game 5 saw Love return to the starting line-up, but despite playing 33 minutes, he managed just two points as the Cavaliers forced a Game 6 with a 112–97 win. Game 6 also saw Love struggle, but the Cavaliers managed a 115–101 win to force a Game 7. The Cavaliers won Games 5 and 6 with Love contributing just nine total points on 2-of-8 shooting. With the series tied a 3–3, Love managed 9 points and 14 rebounds in Game 7 to help the Cavaliers win the series 4–3, as they became the first team to rally from a 3–1 finals deficit, beating the Warriors 93–89 in Game 7 to end a 52-year major sports championship drought in Cleveland. On October 25, 2016, after receiving his first championship ring prior to the season opener, Love recorded 23 points and 12 rebounds in a 117–88 win over the New York Knicks. On November 3, he scored a then season-high 26 points in a 128–122 win over the Boston Celtics, helping the Cavaliers go 5–0 for the first time since 1976–77 when they started 8–0. On November 23, he scored 40 points, including an NBA-record 34 in the first quarter, to help the Cavaliers defeat the Portland Trail Blazers 137–125. His 34 first-quarter points were the second most all-time in a quarter; Klay Thompson of the Golden State Warriors set the record at 37 in the third quarter on January 23, 2015. Five days later, he was named Eastern Conference Player of the Week for games played Monday, November 21 through Sunday, November 27. Love led the Cavaliers to a 3–0 week behind an East-leading 30.7 points per game. On December 25, he scored 20 points in 109–108 win over the Warriors, recording his 10,000th career point in the process. On January 26, 2017, Love was named an Eastern Conference All-Star reserve for the 2017 NBA All-Star Game. However, on February 14, 2017, he underwent arthroscopic surgery to remove a loose body from his left knee, and was subsequently ruled out for approximately six weeks, thus missing the All-Star Game. On March 16, he played his first game for the Cavaliers since February 11 and had 10 points and nine rebounds in 19 minutes in a 91–83 win over the Utah Jazz. In Game 1 of the Eastern Conference Finals against the Boston Celtics on May 17, Love scored a playoff career-high 32 points and had 12 rebounds to help the Cavaliers improve to 9–0 in the first three rounds of the playoffs, defeating the Celtics 117–104. With 15 points in Game 5 of the series, Love helped the Cavaliers defeat the Celtics 135–102 to claim their third straight Eastern Conference title and a return trip to the NBA Finals. After going down 3–0 in the 2017 NBA Finals, Love made six 3-pointers and had 23 points in Game 4 to help Cleveland extend the series and avoid a sweep with a 137–116 win over the Warriors. The Cavaliers went on to lose to the Warriors in Game 5, thus losing the series 4–1. In the Cavaliers' season opener on October 17, 2017, Love scored 15 points in a 102–99 win over the Boston Celtics. He hit a critical 3-pointer with 46.3 seconds left to put Cleveland up 102–98. On November 7, 2017, he had a then season-best game with 32 points and 16 rebounds in a 124–119 win over the Milwaukee Bucks. On November 28, 2017, he scored 32 of his 38 points in the first half of the Cavaliers' 108–97 win over the Miami Heat. He scored 22 points in the first quarter and finished 10 of 16 from the field and 14 of 17 on free throws. On December 25, 2017, he had a game-high 31 points and a season-best 18 rebounds in a 99–92 loss to the Golden State Warriors. On January 30, 2018, Love left the Cavaliers' game against the Detroit Pistons with a fracture in his left hand. He missed six weeks and 21 games with the injury, returning to action on March 19 against the Bucks. He scored 18 points in 25 minutes in a 124–117 win. Two days later, he recorded 23 points and 12 rebounds in a 132–129 win over the Toronto Raptors. He knocked down his 1,000th career 3-pointer during the game. On April 1, 2018, he recorded his 400th career double-double with 13 points and 13 rebounds in a 98–87 win over the Dallas Mavericks. In Game 2 of the Cavaliers' second-round playoff series against the Raptors, Love had his best game of the postseason with 31 points and 11 rebounds in a 128–110 win, helping Cleveland take a 2–0 lead in the series. Love missed matching his career playoff high by one point. In Game 4 against Toronto, Love scored 23 points in a 128–93 series-clinching win. During the game, Love became the fourth player in Cleveland history with 500 career playoff rebounds, joining LeBron James, Tristan Thompson and Zydrunas Ilgauskas. In Game 1 of the NBA Finals, Love recorded 21 points and 13 rebounds in a 124–114 overtime loss to the Warriors. The Cavaliers went on to lose the series in four games. In the aftermath of LeBron James' departure in free agency to the Los Angeles Lakers, the Cavaliers aggressively pushed to secure Love for the long term. On July 24, 2018, Love signed a four-year, $120 million extension with the Cavaliers. He appeared in the first four games of the regular season before being sidelined with an injured left foot. On November 2, Love had surgery to rectify a painful big toe injury on his left foot. The injury had bothered him since the preseason opener and affected his ability to walk. He was initially ruled out for six weeks, but that was later pushed back to the new year. Love was a member of the United States national team that won the gold medal at the 2010 FIBA World Championship. Love made the 2012 Olympic team on July 7, 2012. 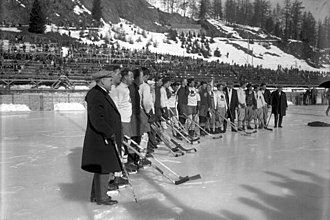 The team finished undefeated, winning the gold medal over runners-up Spain. Mired in unresolved trade talks between Minnesota and other NBA teams, Love withdrew himself from the 2014 FIBA Basketball World Cup (formerly World Championship) team. Love's uncle, Mike, is a founding member of The Beach Boys and brother of Love's father, Stan. Mike and Stan's cousins include Beach Boys' mastermind Brian Wilson, and the late Carl Wilson and Dennis Wilson. Love's aunt, Kathleen McCartney Hearst, was an accomplished triathlete. He has an older brother, Collin, and a younger sister, Emily. His middle name, Wesley, is in honor of Wes Unseld, the former Washington Bullets center and the Loves' family friend. In 2009, Love became the first among NBA players to join the Hoops for St. Jude charity program benefitting the St. Jude Children's Research Hospital, after working with the hospital as part of the league's "Rookie Relief" community outreach program in his first season in the league. In March 2018, Love revealed–in response to DeMar DeRozan's public discussion of his struggles with depression–that he had been seeing a therapist for several months following a panic attack during a game in November 2017. He wrote of "creating a better environment for talking about mental health" and the need to remember that "Everyone is going through something that we can't see." In August 2018, Love continued his advocacy for mental health awareness, discussing his family's history of depression, along with his own struggles with anxiety, rage, and "dark times" where he would hide in his room and not talk to anyone. Love says he's now committed to forming a foundation focusing on mental health, particularly for young boys, adding that he believes he's "found [his] life's work." In 2011, Love signed a 6-year endorsement contract with the Chinese shoe company 361 Degrees. In 2012, he appeared in the second Pepsi Max edition of "Uncle Drew" with future teammate Kyrie Irving. Love is also an investor in the lifestyle website 12Society. In 2016, Love became the new style ambassador and campaign model for Banana Republic. Love appeared on the front cover of the video game NCAA Basketball 09. He was one of the featured stars in the film Gunnin' for That No. 1 Spot. He appeared as himself on the Disney Channel show The Suite Life on Deck during the season 3 episode Twister: Part 1 along with Dwight Howard and Deron Williams. He appeared in the HBO television series Entourage in its seventh-season finale Lose Yourself. ^ a b "Kevin Love passes Moses Malone". ESPN. Associated Press. March 9, 2011. Retrieved March 9, 2011. ^ a b "USA Basketball: Kevin Love". 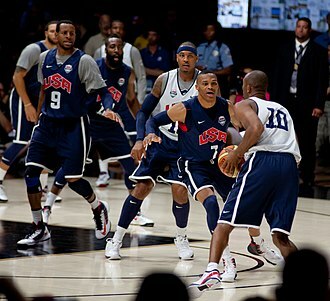 USA Basketball. Archived from the original on July 26, 2015. Retrieved August 25, 2014. ^ a b Branch, John. "Having Fun, Fun, Fun as a Freshman at U.C.L.A." The New York Times. Retrieved August 25, 2014. 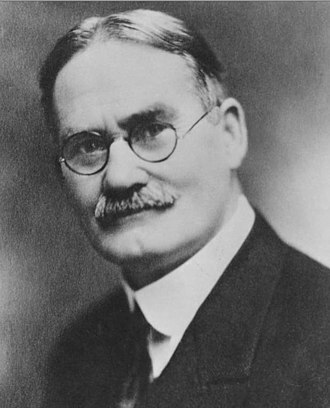 ^ Jenkins, Lee. "Love finally has a pair of enticing reasons to stay in Minnesota". Sports Illustrated. Retrieved August 25, 2014. ^ "Kevin Love NBA & ABA Stats". Basketball Reference. Retrieved August 25, 2014. ^ a b c d e f "UCLA Player Bio: Kevin Love". UCLABruins.com. Archived from the original on February 23, 2011. ^ a b "OSAA Boys' Basketball State Champions" (PDF). Oregon School Activities Association. 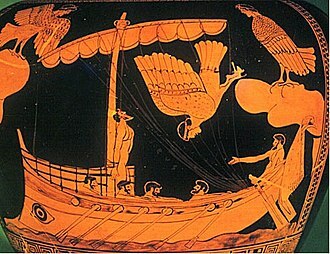 Retrieved April 27, 2007. ^ a b Jung, Helen (26 July 2006). "Love and sneaker wars". The Oregonian. Retrieved October 19, 2010. ^ Stewart, Bill (12 April 2007). "Awards pile up for Kevin Love". Lake Oswego Review. Retrieved February 9, 2010. 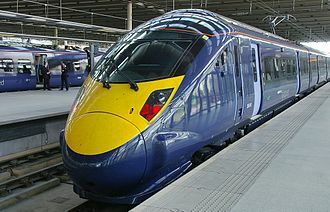 ^ Carpenter, Holly (10 March 2007). "South Medford takes title". The Oregonian. Retrieved October 18, 2010. ^ Katz, Andy (25 July 2006). "Love-fest: Hoop phenom says he'll attend UCLA". ESPN. Retrieved October 16, 2010. ^ Pucin, Diane (9 November 2008). "Love signs, makes Howland's day". Los Angeles Times. Retrieved October 19, 2010. ^ "Kevin Love 2007 Basketball Recruiting Profile". ESPN. Retrieved October 18, 2010. ^ Parikh, Sagar (6 April 2006). "Hazzard to give up number". The Daily Bruin. Archived from the original on April 10, 2007. Retrieved February 21, 2007. ^ Katz, Andy (October 22, 2007). "Love reaches out to the Wizard for advice, history". ESPN. Retrieved October 22, 2007. ^ Wahl, Greg (26 February 2008). "Over the Top". SI.com. Retrieved March 5, 2008. ^ Streeter, Kurt (31 January 2008). "University must enforce an attitude adjustment in fans". Los Angeles Times. Retrieved July 15, 2010. ^ "Wolves sign Love". NBA. July 11, 2008. Retrieved February 7, 2010. ^ Staff Writer (April 18, 2008). "UCLA's Love says he's headed to the NBA". ESPN. Retrieved February 7, 2010. ^ Ford, Chad (June 27, 2008). "Mayo heads to Memphis, Love to Minnesota in blockbuster trade". ESPN. Retrieved February 7, 2010. ^ Staff Writer (June 17, 2008). "O. J. Mayo, Kevin Love trading places in eight-player swap". USA Today. Retrieved February 22, 2010. ^ "2008 NBA Summer League Statistics". NBA. Archived from the original on July 14, 2015. ^ Krawczynski, Jon (October 29, 2008). "Love's efficient night helps Wolves escape". Yahoo! Sports. Associated Press. Retrieved February 25, 2010. ^ Staff Writer (December 8, 2008). "4–15 Minnesota Timberwolves fire Randy Wittman". ESPN. Retrieved February 25, 2010. ^ Zgoda, Jerry (June 25, 2008). "Kevin Love a mirror image of McHale". Star Tribune. Archived from the original on February 9, 2009. Retrieved February 26, 2010. ^ Bolch, Ben (January 20, 2009). "Kevin McHale really likes Kevin Love". Los Angeles Times. Retrieved February 26, 2010. ^ Imus, Karly (July 23, 2009). "Kevin Love looking for bigger, better achievements". The Oregonian. Retrieved February 28, 2010. ^ Stephens, Jerry (February 5, 2009). "Former Lake Oswego star, Kevin Love becomes a marquee name thanks to McHale". The Oregonian. Retrieved October 18, 2010. ^ Staff Writer (January 29, 2009). "McHale: Love's rookie game snub 'utterly ridiculous'". USA Today. Retrieved February 28, 2010. ^ Zgoda, Jerry (January 29, 2009). "Wolves upset over Love's omission from showcase". Star Tribune. Archived from the original on February 1, 2009. Retrieved October 17, 2010. ^ Staff Writer (February 9, 2009). "Jefferson has torn ACL in right knee". ESPN. Retrieved February 28, 2010. ^ Official Release (April 3, 2009). "Bulls' Rose, Wolves' Love named Rookies of the Month". Archived from the original on November 9, 2012. Retrieved February 28, 2010. ^ "Kevin Love Named to All-Rookie Second Team". NBA. Retrieved May 26, 2009. ^ Howard-Cooper, Scott (August 17, 2009). "Love, Team USA begin courtship". SI.com. Retrieved July 14, 2010. ^ "Kevin Love Selected To Participate In Mini-Camp". NBA. Retrieved July 14, 2010. ^ Staff Writer (June 17, 2009). "Love: McHale won't return". ESPN. Retrieved March 10, 2010. ^ "Wolves' Love likely to miss six weeks". ESPN. 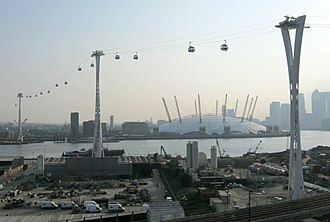 August 17, 2009. Retrieved July 14, 2010. ^ Aschburner, Steve (December 5, 2009). "From Minnesota with Love: Wolves finally looking better". NBA. Retrieved July 14, 2010. ^ "TIMBERWOLVES: NBA All-Stars Central 2010". NBA. Archived from the original on November 10, 2012. Retrieved July 26, 2012. ^ Blinebury, Fran (February 13, 2010). "Rooks grab rare win over NBA sophomores". NBA. Archived from the original on March 6, 2011. ^ a b Mannix, Chris (November 13, 2010) Memo to Timberwolves: Love is a talent worth developing. SI.com. ^ "Kevin Love posts NBA's 1st 30–30 game in 28 years as Knicks fade in 4th". Associated Press. November 12, 2010. Retrieved November 12, 2010. ^ Krawczynski, Jon (November 12, 2010). "Love has 30–30 game in Wolves' win over Knicks". USAToday. Retrieved November 12, 2010. ^ "Kevin Love's career night not enough for Minnesota against Denver". ESPN. Associated Press. December 18, 2010. Archived from the original on February 28, 2011. ^ "NBA announces All-Star reserves". ESPN. February 4, 2011. Archived from the original on February 5, 2011. ^ "Kevin Love selected as final All-Star". ESPN. February 4, 2011. Archived from the original on February 5, 2011. ^ Deveney, Sean (February 4, 2011). "Kevin Love named injury replacement in All-Star Game". SportingNews.com. Archived from the original on February 5, 2011. ^ "Kevin Love sets Minnesota mark with 38th consecutive double-double". ESPN. Associated Press. February 8, 2011. Archived from the original on February 9, 2011. ^ "Kevin Love's 46th straight double-double helps Wolves snap skid". ESPN. Associated Press. February 27, 2011. Archived from the original on February 28, 2011. ^ a b "Kevin Love's double-double streak ends at 53 in Wolves' loss against Warriors". ESPN. Associated Press. March 13, 2011. ^ "Trevor Ariza, Chris Paul lift Hornets past reeling Timberwolves". ESPN. Associated Press. February 25, 2011. Retrieved February 26, 2011. Malone also had a 51-game run from 1979–80. ^ Beilby, Jim (February 23, 2011). "Grizzlies-Wolves notebook". NBA. Retrieved February 25, 2011. The next longest streak is also Malone's, who tallied a 51 game streak of double-doubles spanning the 1978–79 and 1979–80 seasons. ^ Narducci, Marc (March 4, 2011). "Love's mastery of the double-double could be troublesome for 76ers". The Philadelphia Inquirer. Archived from the original on March 10, 2011. ^ "Elias Says..." ESPN. Elias Sports Bureau. March 10, 2011. Archived from the original on March 10, 2011. ^ "Kevin Love could miss rest of season". ESPN. Associated Press. March 24, 2011. Retrieved March 24, 2011. Love sat out Thursday night's game against Dallas after he was hurt in a 127–95 home loss to Sacramento on Sunday. ^ a b "Rockets send Timberwolves to 15th straight loss". ESPN. Associated Press. April 13, 2011. Archived from the original on April 14, 2011. 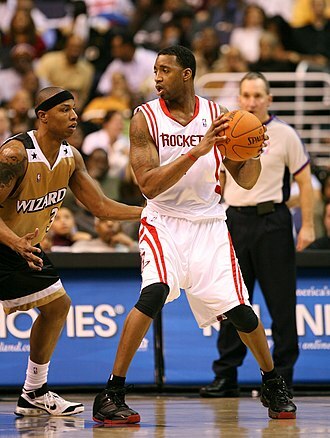 ^ "Rockets-Timberwolves Preview – April 12, 2011". CBSSports.com. Associated Press. April 12, 2011. Archived from the original on April 14, 2011. ^ "Wolves' Love wins Kia Most Improved Player Award" (Press release). NBA Media Ventures, LLC. April 21, 2011. Archived from the original on April 21, 2011. ^ "Report: Kevin Love wins Most Improved". ESPN. Associated Press. April 21, 2011. Archived from the original on April 21, 2011. ^ Walters, Charley (June 20, 2011). "Shooter Now: Rubio's No. 9 jersey expected to be most anticipated seller in Timberwolves' history". twincities.com. Retrieved June 20, 2011. ^ a b Spears, Marc J. (July 9, 2012). "Kevin Love losing patience with Timberwolves' losing, wants roster upgraded". yahoo. Archived from the original on July 9, 2012. ^ Stein, Marc; Broussard, Chris (January 25, 2012). "Kevin Love, Wolves agree to deal". ESPN. Archived from the original on January 26, 2012. ^ Stein, Mark. "Kevin Love, Wolves agree to deal". sports.yahoo.com. Accessed September 30th 2013. ^ a b "Minnesota Timberwolves vs. Dallas Mavericks – Box Score – January 25, 2012". ESPN. January 25, 2012. Retrieved July 26, 2012. ^ a b "Kevin Love, strong backcourt lead Wolves past Kings". ESPN. Associated Press. January 16, 2012. Archived from the original on January 17, 2012. ^ Yahoo! Sports 7 hours, 48 minutes ago. "Timberwolves Team Report – NBA – Yahoo! Sports". Sports.yahoo.com. Archived from the original on July 14, 2012. Retrieved July 26, 2012. ^ "FINAL". NBA. Retrieved July 26, 2012. ^ "Wolves' Love finishes sixth in NBA MVP voting". Foxsportsnorth.com. May 12, 2012. Retrieved July 26, 2012. ^ "Kevin Love: 'I want to win'". ESPN. July 9, 2012. Archived from the original on July 9, 2012. ^ "Timberwolves' Kevin Love out 6-8 weeks with broken hand". USA Today. October 17, 2012. Retrieved October 17, 2012. ^ "Kevin Love makes season debut". Associated Press. Retrieved November 21, 2012. ^ "Kevin Love unsure about Timberwolves' future – Yahoo! Sports". sports.yahoo.com. Retrieved November 11, 2014. ^ "Wolves Forward Kevin Love To Undergo Surgery On Right Hand". NBA.com. Retrieved January 10, 2013. ^ "Kevin Love out 8-10 weeks for Timberwolves with broken hand". USA Today. Associated Press. January 9, 2013. Retrieved January 11, 2013. ^ Aschburner, Steve. "Rescue Timberwolves? Rubio's return could rev them up". NBA.com. Retrieved January 10, 2013. ^ "Love's hand is healing; shot still hurting". Retrieved January 10, 2013. ^ Feldman, Dan (March 10, 2014). "Kevin Love sets Minnesota Timberwolves' single-season 3-pointer record". ^ Babb, Stephen. "Kevin Love's Career Year Sets Historic NBA Record". ^ "Kevin Love traded to Cavaliers". ESPN. August 23, 2014. Retrieved August 23, 2014. ^ "Cavs Acquire All-Star Forward Kevin Love". NBA.com. Turner Sports Interactive, Inc. August 23, 2014. Retrieved August 23, 2014. ^ "Love gets message from LeBron, scores 32 in Cavs' win". NBA.com. Turner Sports Interactive, Inc. February 8, 2015. Retrieved February 8, 2015. ^ "Love hits 8 3-pointers, Cavaliers beat Pistons 102-93". NBA.com. Turner Sports Interactive, Inc. February 24, 2015. Retrieved February 25, 2015. ^ a b Haynes, Chris (April 29, 2015). "Kevin Love undergoes surgery on dislocated shoulder, out 4-6 months". Cleveland.com. Archived from the original on April 30, 2015. ^ Haynes, Chris (April 27, 2015). "Kevin Love shoulder injury: Cleveland Cavaliers forward out for entire Eastern Conference semifinals". Cleveland.com. Archived from the original on April 27, 2015. ^ "Smith, Olynyk suspended; Perkins fined" (Press release). NBA. April 27, 2015. Archived from the original on April 28, 2015. ^ Stein, Marc (June 24, 2015). "Kevin Love opts out of deal with Cavaliers". ESPN. Retrieved June 25, 2015. ^ "Cavaliers Re-sign Forward Kevin Love". NBA.com. July 9, 2015. Retrieved July 11, 2015. ^ "LeBron joins "Big O" on elite list, leads Cavs past Magic". NBA.com. November 23, 2015. Retrieved November 24, 2015. ^ "Love, Irving sharp as Cavaliers beat Pistons 114-106". NBA.com. January 29, 2016. Retrieved January 30, 2016. ^ "Big 3 back together, lead Cavs to 106-101 win over Pistons". NBA.com. April 17, 2016. Retrieved April 18, 2016. ^ "James scores 33, Cavaliers reach second straight NBA Finals". NBA.com. May 27, 2016. Retrieved May 27, 2016. ^ Siddiqi, DJ (June 18, 2016). "LeBron James: If we win, no one will criticize Kevin Love". 247sports.com. Retrieved June 19, 2016. ^ "James and Cavaliers win thrilling NBA Finals Game 7, 93-89". NBA.com. June 19, 2016. Retrieved June 19, 2016. ^ "Cavaliers stay unbeaten with 128-122 win over Celtics". ESPN.com. November 3, 2016. Retrieved November 4, 2016. ^ "Love scores 40, including 34 in 1st, James has triple-double". ESPN.com. November 23, 2016. Retrieved November 24, 2016. ^ "Kevin Love, Kevin Durant named Players of the Week". NBA.com. November 28, 2016. Retrieved November 29, 2016. ^ "Mr. Fourth Quarter Caps Christmas Day Comeback Classic". NBA.com. December 25, 2016. Retrieved December 26, 2016. ^ "Kevin Love Status Update - February 14, 2017". NBA.com. February 14, 2017. Retrieved February 14, 2017. ^ "Love returns in win over Jazz, but 2 more Cavs injured". ESPN.com. March 16, 2017. Retrieved March 17, 2017. ^ "Cavaliers rout Celtics as LeBron James, Kevin Love combine for 70". ESPN.com. May 17, 2017. Retrieved May 17, 2017. ^ "Warriors Win N.B.A. Title, Avenging Themselves Against the Cavaliers". New York Times. 13 June 2017. Retrieved October 5, 2017. ^ "NBA finals: Golden State Warriors win title against Cavaliers – as it happened". Guardian. June 13, 2017. Retrieved October 5, 2017. ^ "Love, LeBron push Cavaliers past Bucks 124-119". ESPN.com. November 7, 2017. Retrieved November 7, 2017. ^ "Love scores 38, LeBron ejected as Cavs beat Heat 108-97". ESPN.com. November 28, 2017. Retrieved November 28, 2017. ^ "Durant delivers on both ends, Warriors beat Cavaliers 99-92". ESPN.com. December 25, 2017. Retrieved December 25, 2017. ^ "Kevin Love suffers broken left hand, reportedly could miss 6-8 weeks". NBA.com. January 30, 2018. Retrieved January 30, 2018. ^ "LeBron gets triple-double, Cavs beat Bucks without Lue". ESPN.com. March 19, 2018. Retrieved March 19, 2018. ^ "LeBron scores 35, carries Cavaliers past Raptors 132-129". ESPN.com. March 21, 2018. Retrieved March 22, 2018. ^ "LeBron, Cavs struggle before beating Mavericks 98-87". ESPN.com. April 1, 2018. Retrieved April 1, 2018. ^ "James scores 43 as Cavs beat Raptors 128-110 in Game 2". ESPN.com. May 3, 2018. Retrieved May 3, 2018. ^ "LeBroom: James, Cavs sweep Raptors to make conference finals". ESPN.com. May 7, 2018. Retrieved May 7, 2018. ^ "Warriors withstand James' 51 points to win NBA Finals Game 1". ESPN.com. May 31, 2018. Retrieved May 31, 2018. ^ a b Wojnarowski, Adrian; Windhorst, Brian (July 24, 2018). "Kevin Love signs 4-year, $120M extension with Cavaliers". ESPN.com. Retrieved July 24, 2018. ^ "Cavs and Love Sign Long-Term Contract Extension". NBA.com. July 24, 2018. Retrieved July 24, 2018. ^ "Kevin Love Undergoes Successful Surgery". NBA.com. November 2, 2018. Retrieved November 2, 2018. ^ a b "Kevin Love: Likely won't return to Cavs until after new year". ESPN.com. November 20, 2018. Retrieved November 21, 2018. ^ "Love Named A Finalist For The 2012 U.S. Olympic Team". NBA. January 16, 2012. Archived from the original on January 25, 2012. ^ Windhorst, Brian (July 26, 2014). "Kevin Love pulls out of Team USA". ESPN. Archived from the original on July 26, 2014. ^ Harris, Beth (February 9, 2008). "Kevin Love's old-school game, maturity make him a college throwback at UCLA". USA Today. ^ Love, Kevin (March 6, 2018). "Everyone Is Going Through Something". The Players' Tribune. Retrieved March 11, 2018. ^ Boren, Cindy (March 6, 2018). "'Everything was spinning': Kevin Love opens up about his in-game panic attack". Washington Post. Retrieved March 11, 2018. ^ MacMullan, Jackie (August 20, 2018). "The courageous fight to fix the NBA's mental health problem". ESPN. Retrieved August 27, 2018. ^ MacMullan, Jackie (August 24, 2018). "Trae Young, Kevin Love and the future of mental health in the NBA". ESPN. Retrieved August 27, 2018. ^ Eggers, Kerry (December 1, 2011). "You'll see less of Love this season". The Portland Tribune. Archived from the original on May 15, 2012. ^ Mehta, Stephanie N. (May 23, 2012). "NBA's Kevin Love is latest player in celeb-tech mashup". CNN. Archived from the original on August 19, 2012. Retrieved July 26, 2012. ^ Gustashaw, Megan (March 3, 2016). "Cavaliers Player Kevin Love is the New Face of Banana Republic". GQ.com. Retrieved August 2, 2016. ^ "Kevin Love on the cover of NCAA Basketball 09". BruinsNation.com. Retrieved April 23, 2012. ^ "Dwight, Kevin Love, DWill on 'The Suite Life'". Slamonline.com. January 6, 2011. Retrieved July 26, 2012. Wikimedia Commons has media related to Kevin Love. It began on March 18,2008, and concluded on April 7 at the Alamodome in San Antonio. For the first time since seeding began, all four of the top seeds advanced to the Final Four. Memphis and Kansas advanced to the championship game, with Memphiss victory in the semifinals giving them a record-setting 38 for the season. Kansas, spoiled their national championship hopes by handing the Tigers their second loss of the season, winning the game in overtime, Memphiss entire season was vacated by the NCAA due to eligibility concerns surrounding freshman guard Derrick Rose. Entering the tournament on March 18, the top ranked team was North Carolina in both the AP Top 25 and the ESPN/USA Today Coaches Polls, followed by Memphis, UCLA and Kansas. American University, UMBC, Texas-Arlington, and Portland State all entered the tournament for the first time in their schools history, another school, Coppin State won the MEAC Tournament to become the first 20-loss school ever to make the field. Georgia, a team that otherwise would not have advanced to the tournament, won the SEC tournament to qualify, and were awarded a #14 seed, whereas the 2007 tournament did not see many upsets, the 2008 tournament was full of them. 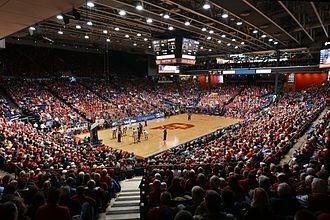 The sub-regional pod played at the St. Pete Times Forum in Tampa, #5 seeds Drake and Clemson fell to #12 seeds Western Kentucky and Villanova while the #4 seeds in that same pod and Connecticut, were defeated by #13 seeds Siena and San Diego. Western Kentucky advanced to the West regional in Phoenix where they lost to UCLA while Villanova was one of two double digit seeds to advance to the Midwest regional. The other was #10 seed Davidson, who rode the hot shooting of Stephen Curry to defeat Gonzaga and Wisconsin before nearly upsetting Kansas in the regional final. The Midwest region alone saw four of its double digit seeds advance, as in addition to Villanova, the total tournament attendance of 763,607 set a record for highest total tournament attendance, breaking the record set during the 1999 tournament. The NCAA Mens Division I Basketball Championship is an annual tournament featuring 65 teams representing all Division I Conferences in the nation. A play-in game determined which of the two lowest seeds would play in the first round of 64 against a top seed team. Stanley S. Love is a retired American basketball player who is the father of basketball player Kevin Love and the brother of Beach Boys co-founder Mike Love. A69 forward, Love graduated from Morningside High School, California, Love was the 9th pick in the 1971 NBA draft, chosen by the Baltimore Bullets. He was selected by the Dallas Chaparrals in the 1971 ABA Draft and he had been selected in the 1970 ABA Draft by the Texas Chaparrals while still an underclassman. Love had a professional career with Baltimore, the Los Angeles Lakers of the National Basketball Association. He retired from the sport in 1975, with averages of 6.6 points,3.9 rebounds and 2.5 fouls for 14.7 minutes in 239 career games. Love was inducted into the University of Oregon Athletics Hall of Fame in 1994, Love is the father of NBA player Kevin Love, currently a member of the Cleveland Cavaliers, and the younger brother of the Beach Boys vocalist Mike Love. He is a cousin of Beach Boys Brian Wilson and his late brothers Carl Wilson, in the mid-1970s and 1980s, Love was employed as a full-time bodyguard and assistant to Brian Wilson, working to re-acclimate the troubled musicians daily life and keep him drug-free. The Three-Point Contest is a National Basketball Association contest held on the Saturday before the annual All-Star Game as part of All-Star Weekend. From its introduction in 1986 to 2002, and again in 2017, between 2003 and 2016, the contest was open to just six competitors. Eric Gordon is the most recent winner of the event which was held at Smoothie King Arena in New Orleans, in this contest, participants attempt to make as many three-point field goals as possible from five positions behind the three-point arc in one minute. Players begin shooting from one corner of the court, and move from station to station along the three point arc until they reach the other corner, at each shooting station is a rack with five basketballs. Out of the five balls, four are worth one point, the goal of this contest is to score as many points as possible within one minute. A perfect score used to be 30 points, in the 2014 contest, a rack consisting only of money balls was added, and can be placed on any of the 5 spots of the players choice, bringing up the maximum possible score to 34 points. In the qualifying round, each player has a chance to score as many points as possible, the three players with the top scores advance to the finals. 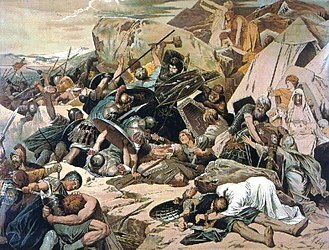 The final round is played in the way as the qualifying round. In each round, the shots and the score are confirmed by the referee, the final round will be shot in reverse direction. In the case of a tie, multiple rounds of 30 seconds are played to determine the winner. Contestants compete for a total of $86,000, the first-place winner receives $35,000, the second-place finisher receives $22,500, and the third-place winner receives $15,000. Finishers, from fourth to sixth place, receive $4,500 each, craig Hodges holds the record for most shots made in one round, as well as most consecutive shots made. Stephen Curry and Klay Thompson hold the record with 27 points, detlef Schrempf and Michael Jordan share the record for the fewest points scored in any round with five in 1988 and 1990 respectively. Sources, a The 1999 All-Star Game was cancelled due to the 1998–99 NBA lockout, B Denote contests that required a tiebreaking round. The Portland Oregon Temple of The Church of Jesus Christ of Latter-day Saints (Mormons) is located in Lake Oswego. Derrick Rose was selected first overall by the Chicago Bulls. 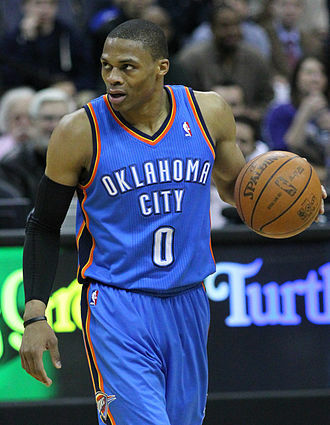 Russell Westbrook was selected fourth by the Seattle SuperSonics. Kevin Love was selected fifth by the Memphis Grizzlies and traded to the Minnesota Timberwolves. Brook Lopez was selected tenth by the New Jersey Nets. UCLA's Marques Johnson also won numerous national Player of the Year honors in 1977. A Turkish Airlines Boeing 737-800 with the livery of the 2010 FIBA World Championship at the Atatürk International Airport in Istanbul. The company was among the official sponsors of the tournament. 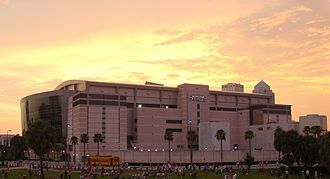 The U.S. Airways Center held the West Regional semifinals and finals on March 27th and 29th, respectively. Ford Field held the Midwest Regional semifinals and finals on March 28th and 30th, respectively. The Amalie Arena saw a record four upsets in four games in the tournament's first round.